This next (and last) installment will be shorter because even I thought the previous one was very lengthy! We began the day by waking up late on purpose. We checked out of the hotel close to 12 in the afternoon. 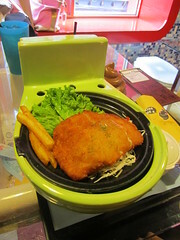 We left our stuff in the hotel lobby and we walked to Modern Toilet restaurant for our brunch. Modern Toilet‘s concept is not new and we had a little discussion on whether it will be worth introducing to the Philippine market. 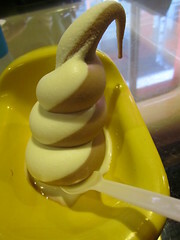 Anyway, the food was just ordinary and the ambience was also respectable. We ordered their pork teriyaki on rice and it was swimming in sauce, it’s a bit hard to eat. 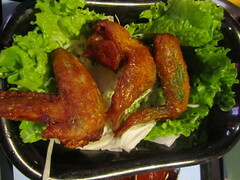 Their lemon chicken wings was just fine; not too ‘lemony’, more like…’dayapy’, hahaha! 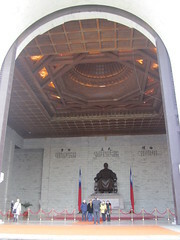 After lunch we took a cab to the Chiang Kai Shek Memorial. I was impressed by their ‘government’ area. I wish we could have seen more students and bureaucrats. 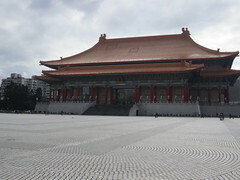 The concert and theater halls inside Liberty Square, near the memorial hall, were impressively huge. 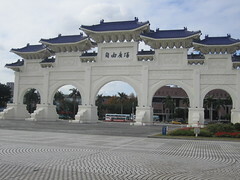 Construction was ongoing in front of the memorial for a light festival, similar to the World Light Expo we had in 2007. 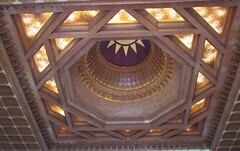 The memorial itself was simple and intricate, particularly the ceiling. 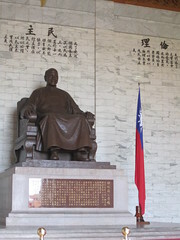 The actual Chiang Kai Shek image was of the Abe Lincoln-type construction. A highlight of our visit was the changing of guards. 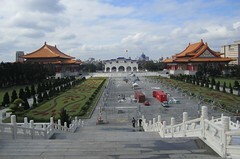 Tip to tourists: go to the memorial before the top of each hour. The changing of guards was interesting to see. 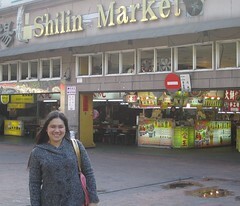 After that, we took the red line of the MRT (Chiang Kai Shek Station) so we can go to Shilin Market. 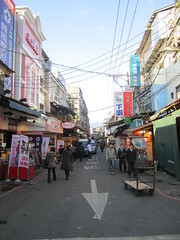 Since it was only 5 pm, the stores were barely opening, including the street of the dry goods market. Since we have an 8 pm pickup to the airport, we decided to go back after a short tour of the shops, but not without buying the famous Hot Star chicken cutlet. For NT$50, you can buy a huge slab of crisp and juicy breaded chicken. 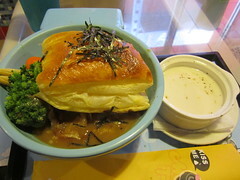 You will also have a choice of regular or spicy; both were already spiced with pepper/paprika, and if you request for spicy, they will sprinkle some curry powder on one side of your order. 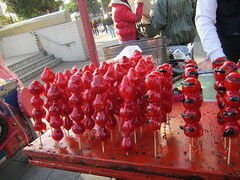 Locals and tourists alike flock this small stall which was just in front of the Shilin Market. 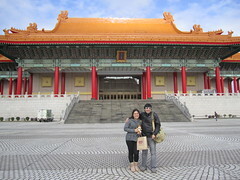 One of my most memorable parts of this trip was the three of us ‘attempting’ to finish our chicken while sitting on a pedestrian bench in front of the busy Zhongzhan N. Road. When we got back to Ximen, Dennis finally decided to buy an Esprit CNY shirt he had an eye on, then we proceeded to Chin May Taiwan Buffet three blocks away for dinner. When you dine there, you simply get a plate (or a box for to-go orders) and point to whatever kind of dish you like. You get charged for what you got. There’s nothing extraordinary in the menu but their fish fillet was not bad. 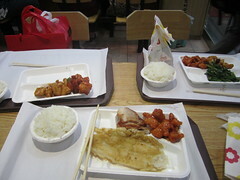 I ordered fish fillet, pork slices with gravy, sweet and sour chicken, and a cup of rice, and paid NT$110. We finally were brought to the car that will take us to the airport at 8 pm (we arranged for it at the hotel’s reception the day before; we paid NT$1000). We overlooked our departure time and said it was at 11 pm, thus the 8 pm pick up. Our flight’s not until past 1 am! Anyway, we thought we can go around the airport and kill time. Sadly, the check-in counter of Cebu Pacific opened at 11 pm already and not one store was open when we got inside. 😦 Hungry passengers only had vending machines of beverages (only!). The airport was also under construction so it was a little uncomfortable to roam around. 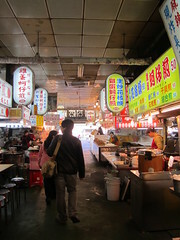 Good thing we had left-over food (donuts, chicken – from Shilin!, chips) and they got us through till boarding time. Our flight took off on time and was uneventful. We were all home by 4:30 a.m. Overall, it was a fun trip, although it’s really short. I am very open to coming back to explore other places. For one, I didn’t get to eat xiao long bao! more travels with your girls soon! teka, sino kaya ang nag-bail out sa US trip nung ’09??? and hello, sinisilipan? ang sarap kaya ng tulog ko. hindi ako yun, yung multo sa room yun.